It’s about time I report on how the last Farm to Frame morning went, in my daughter’s kindergarten class. Recall, this wonderful group of little ones started this project weeks before, learning how to wash wool, dye it, and then card it. They worked hard, and were so busy. 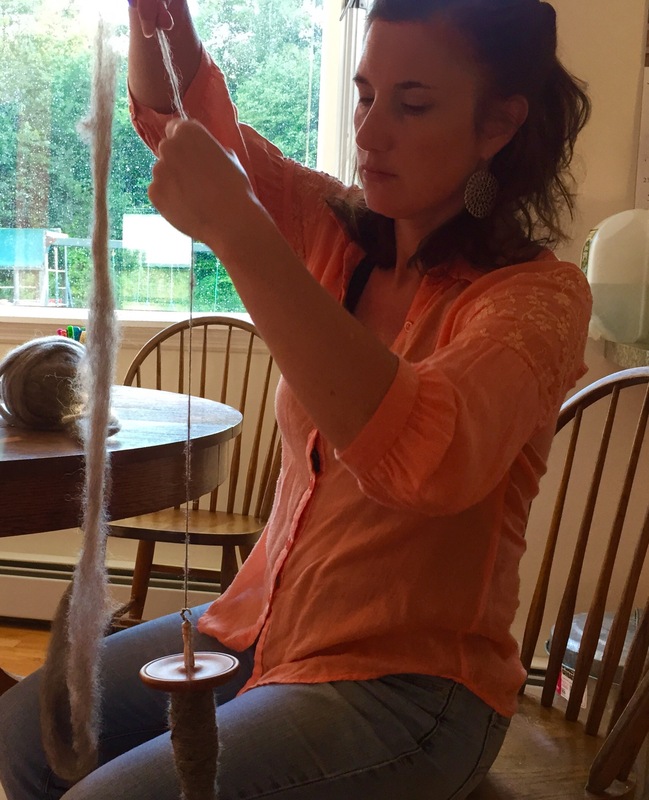 With each passing class, students wanted to keep their wool, and were amazed by how it transformed in their own hands. Finally, the day of the project arrived. I wish I could share pictures of the whole thing in the class, but privacy issues are real and I did not ask for permission to post pictures of other peoples’ children. Included here are picture from a slideshow I made to show to the class to detail what they would be doing that morning. Each student got their own gallon ziplock bag. In it were a bunch of different colors and textures of wool. They all got colors from the batches that they dyed and carded, plus some extra that I already had on hand. Also, they had a piece of pre-felt, the “paper” for their felted painting. Next, I showed the kids how they could layer the scene. I chose to make a sea creature scene to go along with their recent unit on sea life. More examples… my daughter got to demo her skills. I then explained that I’d be securing their pictures using a needle felting tool. It’s sharp! So I emphasized that I’d be the only one using that tool. I wanted to do this before the wet felting part so that it didn’t come apart in the bag. Once the picture was completed, students could tell me or their teacher, and we’d help them slide it into their bags. Enter some warm, soapy water, and let the felting begin! I encouraged gentle, open handed pressing at first. 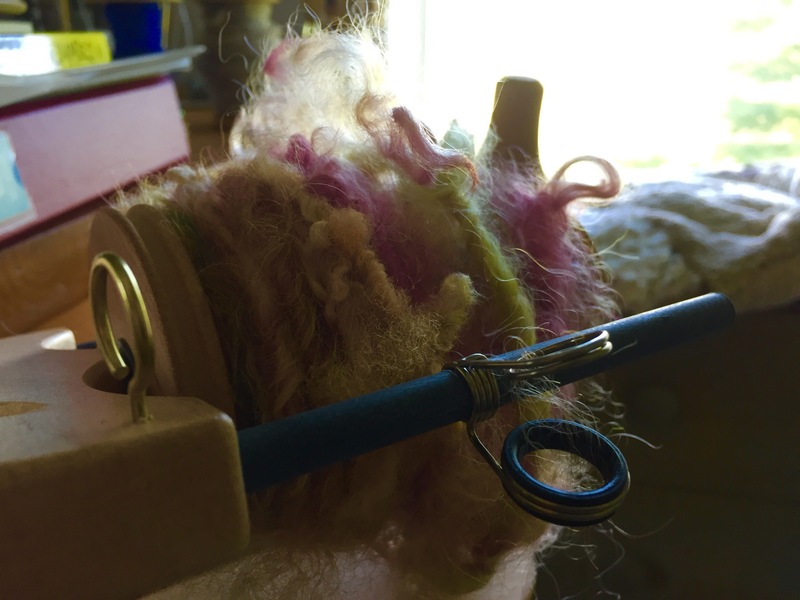 Once felting began, they could lift their bags and really press/rub on both sides. I let them know that their picture would look different once it was felted! This was important. 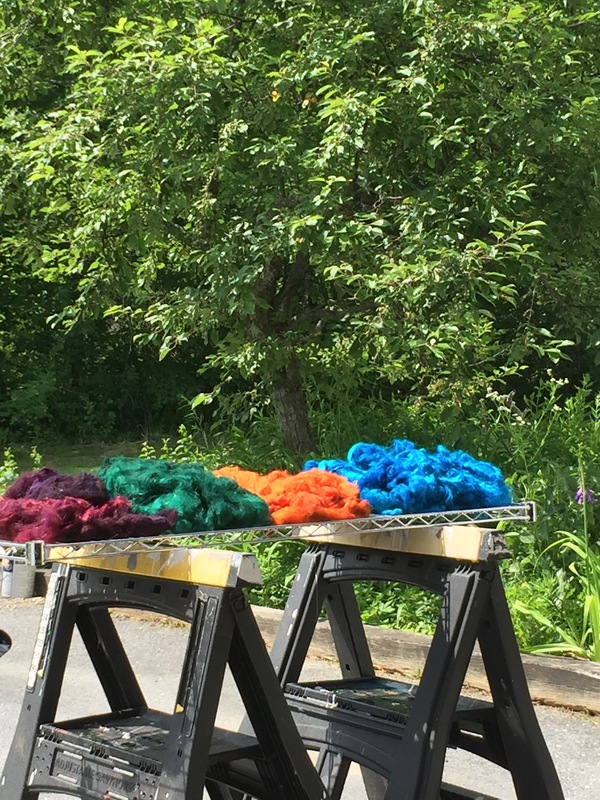 What goes into the bag comes out looking quite different and I encouraged them to be artistic experimenters, learning about what wool does during felting, and watching their beautiful colors take different forms. This proved to be an important reminder to some. Above are the examples of finished products that my daughter and I made at home. All in all the class went beautifully. 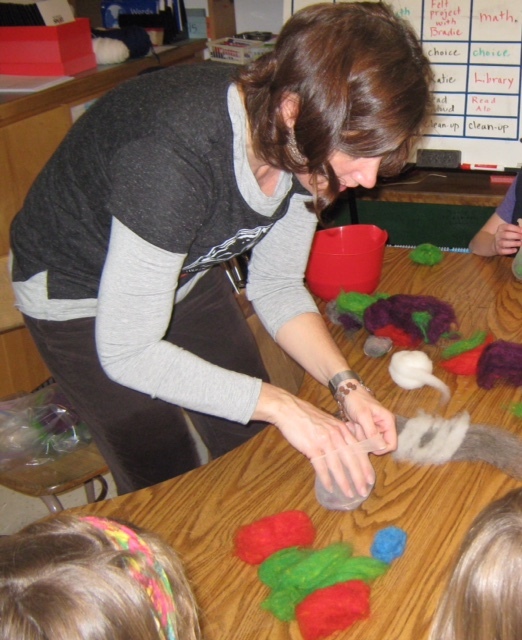 What I learned was, children love working with wool. They love doing the work of preparing it and learning about about other people around the world who make things with it. They responded to the idea that people have been using wool for functional things since the Middle Stone Age. Time, of course, does not make sense to them in that way yet, but feeling connected to our ancient history is important, and it resonated. Children allowed themselves to experiment and to create images, some abstract, and some impressionistic. Some wanted to use every last bit of wool in their bags; some only used a tiny amount and brought the rest home. All, I believe, viewed themselves as artists on that day, and allowed for imperfection and mystery. If I were to do it again, I would work with smaller groups of not more than five children at a time. With sixteen children in class that day, I did not have the time or ability to make it to each child quickly when they had questions or needed help. For me, it felt rushed and a bit stressful. I think I would work it out with the classroom teacher for me to either work in small groups one after the other, or take a couple of mornings to do it. That way, I could calmly help and respond to questions or worries if they came up. Other than that, I think it was a great success. 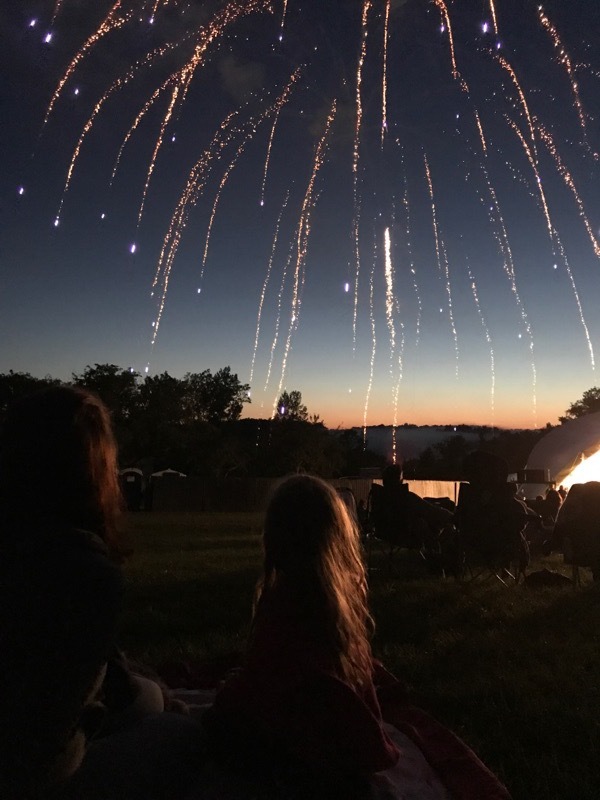 I loved being with my daughter and her classmates and learning about teaching, connecting kids to natural and renewable resources in their own community, as well as to their shared history with our ancient ancestors. Stay tuned as I prepare a new project to bring to my son’s second grade class! This time, it will be a weaving project! 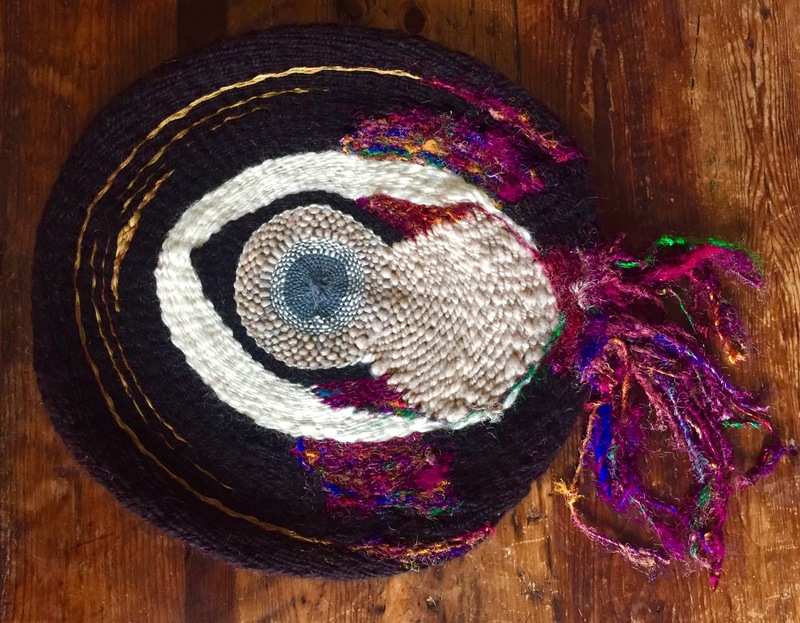 Categories: Fiber Art In Schools | Tags: art, felting, fiber art, imperfection, kindergarten, school, teaching fiber art, Vermont, wool, wool painting | Permalink. Carding Wool is No Joke! I’ve gotten a bit behind in documenting the wonderful work my daughter’s class did in their woolen adventures. 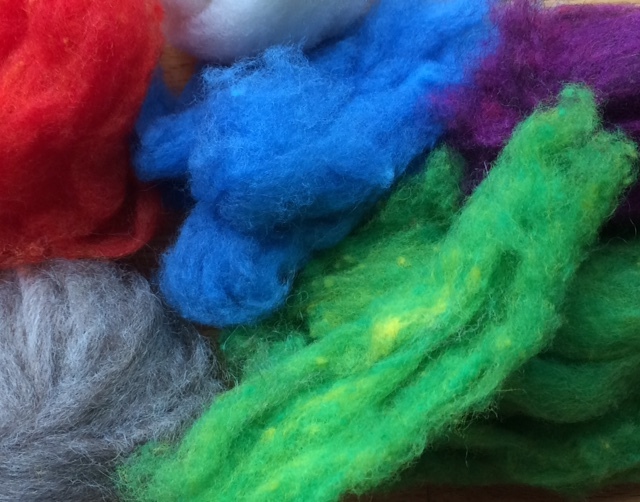 A few weeks ago, the “job” for the day was to card their beautiful, dyed wool. I wanted to share a bit about how we did it and how these young five and six-year olds fared. For the activity that day, I brought in my Fancy Kitty Drum Carder, which I love and adore. I was careful with it, and I had some rules: no touching it without me being right there, don’t crank it as fast as you can, no fingers on the carding cloth, and have fun! I also brought in some mini-hand carders (for this project I actually used small dog brushes (these are not the exact ones I used, but they are similar). I KNOW! CHEESY! But listen, they worked fine for this project, and they were affordable given the quantity I needed.) I brought in my regular sized Ashford Hand Carders as well. The way we organized the class that day was to show a brief slide show talking about carding and what it actually means. Then, I met with about five children at a time. Around a table, they all had locks to start fluffing out. 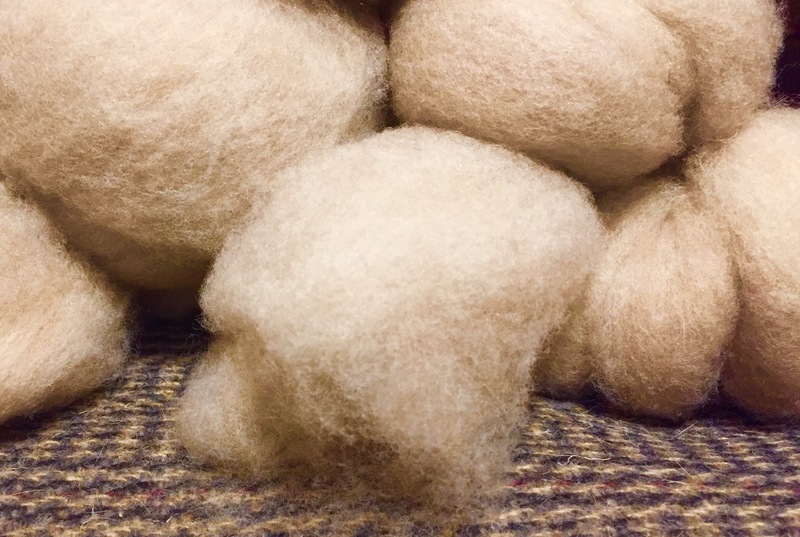 Once enough fiber was fluffed, I taught them how to load the hand-carders. 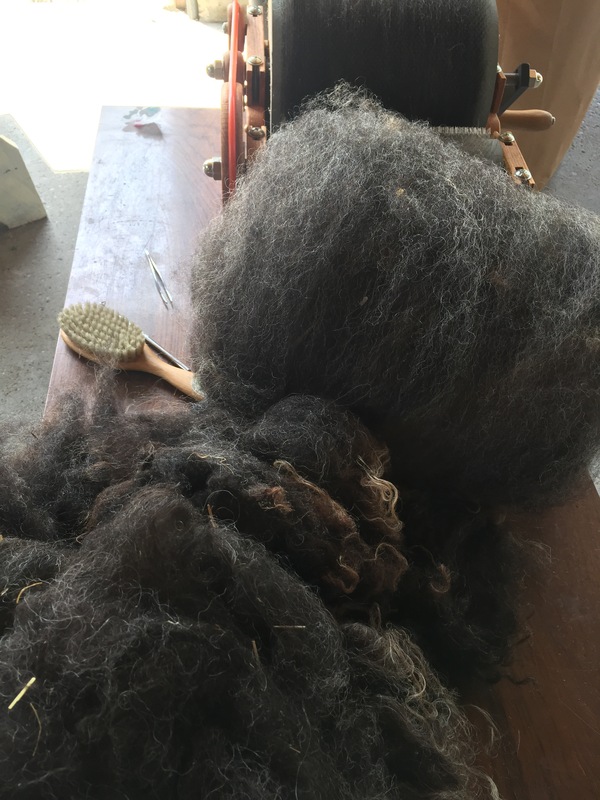 While three students used the hand carders, one fluffed more wool, and the other started the process of carding on the drum carder. They all rotated through all of the jobs. I provided coloring pages for the kids who were waiting for their turn to card. I have to say, the drum carder stole the show. Not one of the students was unimpressed with that tool, and all wanted to use it more. I wished I could have given them more time on it! 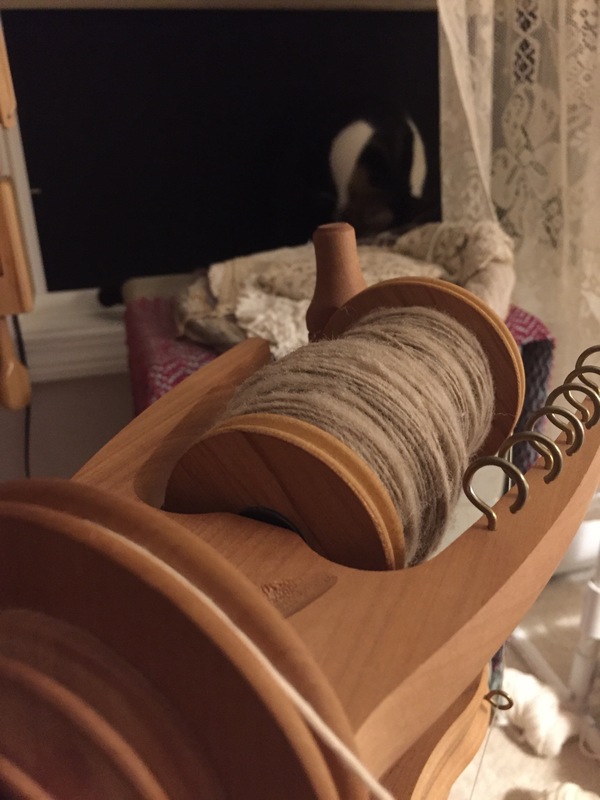 The children were in agreement that adding different colors to the drum carder batt was the way to go, so by the time we got to the very last student, we had a gorgeous tutti-fruity looking batt that I wanted to spin so bad! Oh, the self-control! I think that the kids really got to appreciate the time, patience and purpose behind carding wool. They all seemed to feel like they had put in a good day’s work, including my daughter, who’s seen this all a bunch. I was so proud of them. 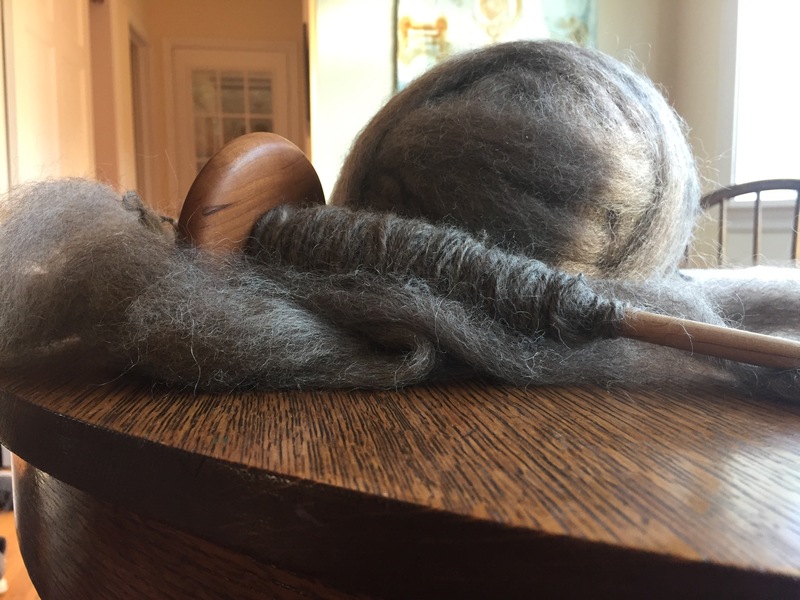 Categories: Fiber Art In Schools | Tags: Ashford Hand Carders, Fancy Kitty Drum Carder, fiber art, handwork in school, kids carding wool, school, teaching fiber art, using dog brushes to card wool, Vermont | Permalink. I’ve gotten a bit behind in sharing what I’m working on. 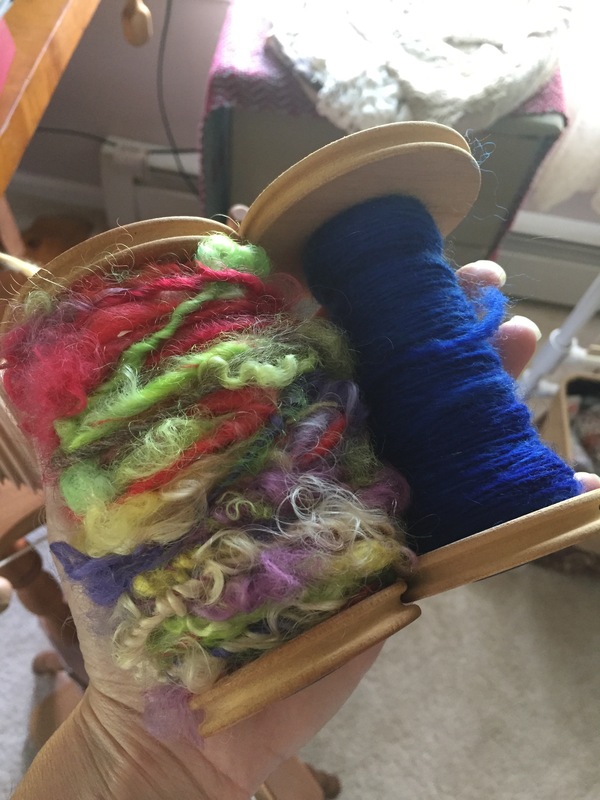 My last post was a share of a fellow blogger who was kind enough to detail her Kool-Aid yarn dyeing know-how. Well, I tried it yesterday with clean, uncarded wool. I needed to practice with the stuff before I brought it into my daughter’s kindergarten class to dye wool that they will be using in an art project in a few weeks. 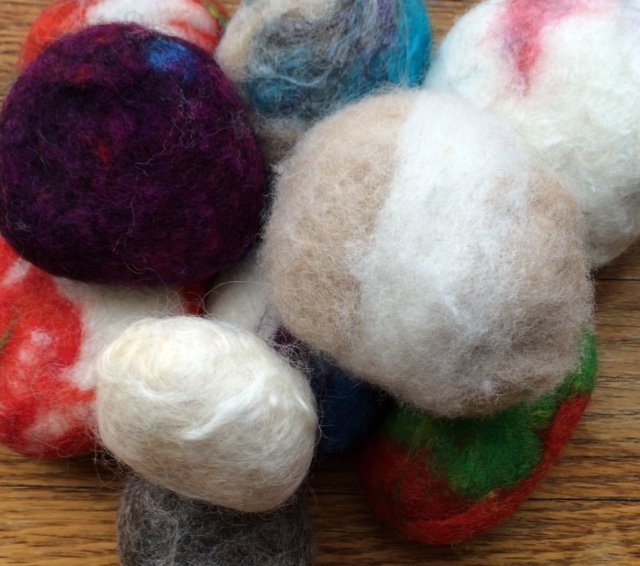 Last week, the children washed raw wool. I wish I could share pictures of it, but you know… privacy and other people’s children is very important to honor! Let me just tell you it was funny, wonderful and I was so proud of all of them. It is true that there was a lot of “ewwwww!!! !” and “gross!” and “it smells like poop!”, but I can assure you that there was no poop in the wool and once they realized it was kind of like petting sheep, they got over it, and all of the kids wanted to put the wool into the warm, soapy water. I had to do a few rinses of the wool once I got home because there just wasn’t time to get it all done at school. This week I’ll bring some of that washed wool back to school to have them dye it. 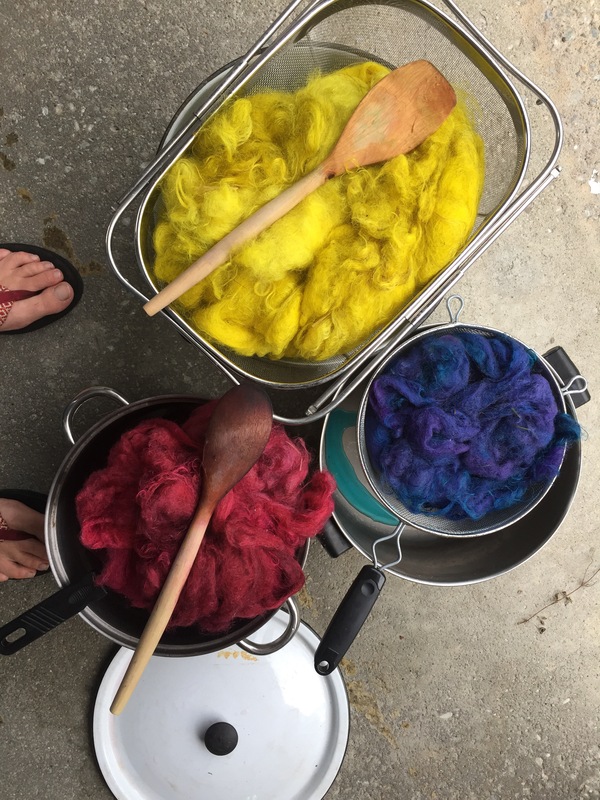 I was stumped when I was trying to figure out how to expose them to wool dyeing- I have gotten really into plant dyes and have done some dyeing with synthetic products, but those are stinky, kind of complicated and very time consuming. 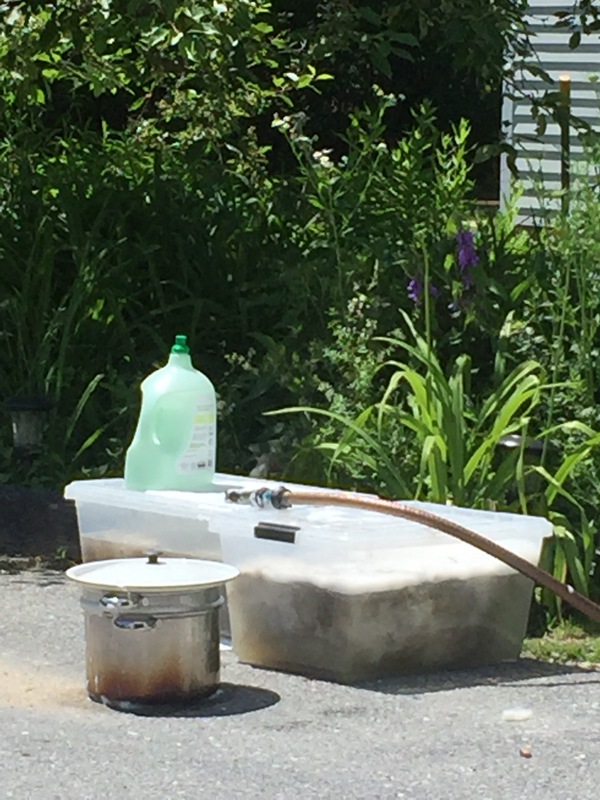 Somewhere along the way, I came across a mention of Kool-Aid dyeing, but when I first started researching it, I found a lot of links to directions involving heat, stoves and time. That’s why I was so excited to find this link. 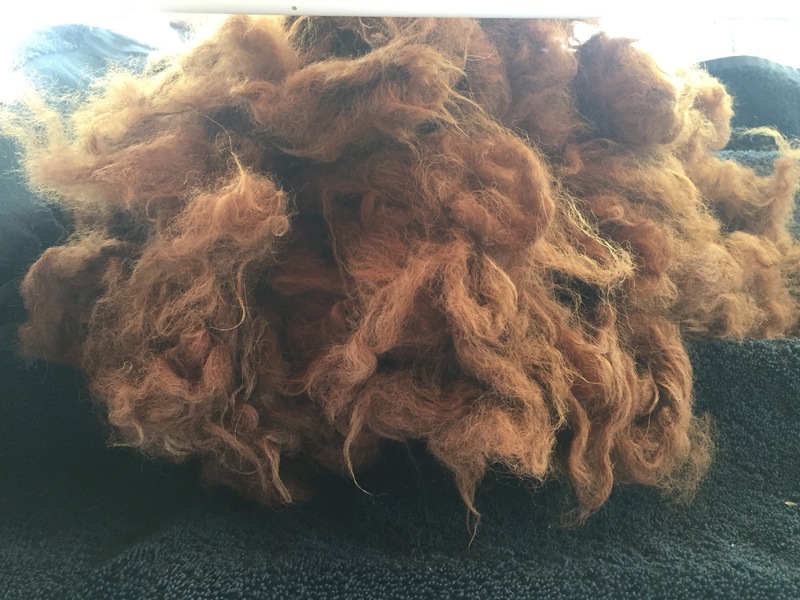 I separated my wool into weighted amounts: 4 2 oz piles and 1 1 oz pile. I then soaked the wool in warm water for 30 minutes. 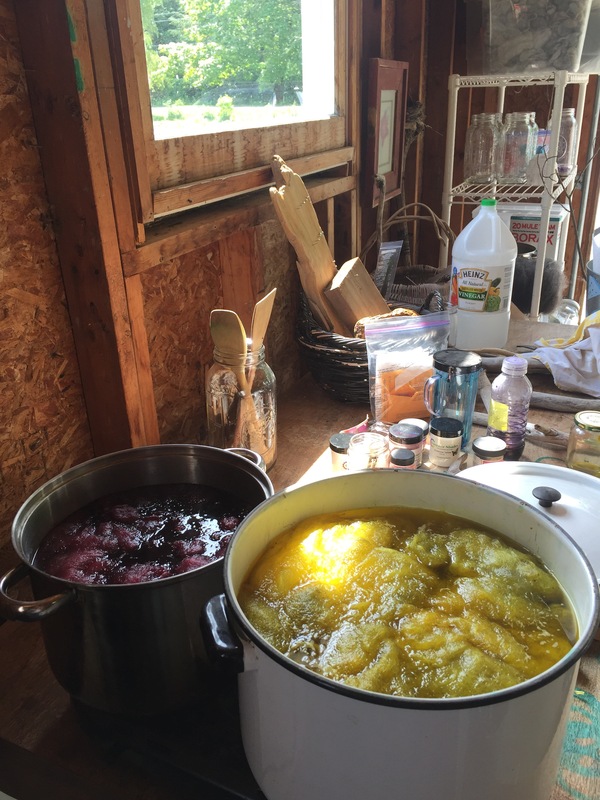 While the wool was soaking, I got my dyes set up. I had three half-gallon mason jars and one one-quart mason jar. In each of the three large mason jars, I put four packets of Kool-Aid, 1/2 cup of white vinegar and filled them about half-way up with warm water. I then stirred the mixture well. In the one-quart mason jar, I put two packets of Kool-Aid, a 1/4 cup of white vinegar, and half filled it with warm water. I had an extra glass bowl hanging around and put three packets of raspberry Kool-Aid in that, along with 1/2 cup of white vinegar and some warm water. Once the 30-minutes of soaking was up, I put the wool in their respective jars and bowl, added warm water until the wool was submerged, covered the jars and bowl and then put them all in a sunny spot for about 4 hours. When I was happy with the color absorption, I pulled out the wool and rinsed. I was delighted with the results and know this will be wonderful for a classroom experiment/project. The color was not totally spent in the dye bath; I’m not sure if that’s because I used too much Kool-Aid for the fiber that was in the bath, or if I didn’t leave it in long enough. I am so excited to do this with the kids next week. I’ll let you know how it goes. 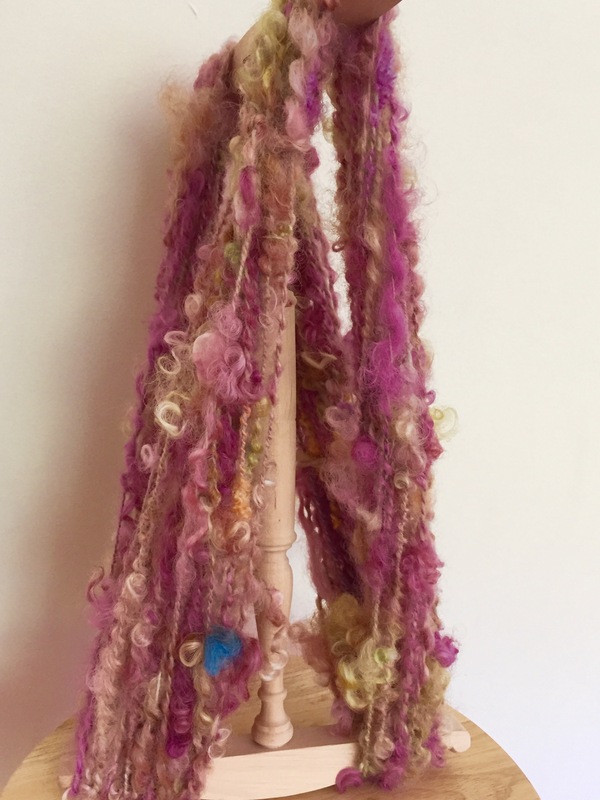 Categories: Fiber Art In Schools | Tags: children and wool projects, dyeing wool with kids, dyeing wool with Kool-Aid, easy wool dyeing, fiber art, Fiber Art in School, Kool-Aid, no-heat wool dye, school, teaching fiber art | Permalink. Well, Felted Rocks, Part. 2 happened before Christmas. In fact, it happened about a week before Christmas. I am just now catching my breath and thinking about what is ending with this year and what is starting with the almost new. 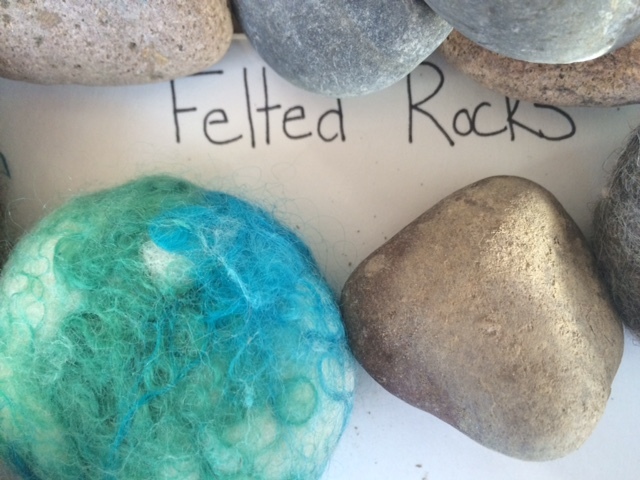 I wanted to take a moment to document the wonderful experience of felting rocks with two 2nd grade classes (one of them being my son’s class). Sometimes, I get bogged down by insecurity. I worry that I get ahead of myself and that really, all of my enthusiasm and energy is momentary, and maybe even a bit much for the people who I want to share it with. But let me tell you this: kids like to felt. And how ’bout this nugget of truth: kids think sheep are really cute and like to look at pictures of them and like to learn about them. For the 2nd graders, I opted to up the game a little by showing them a short slide show capturing the history of humans’ relationship with sheep. I learned so much in the creating of this! Like, humans have been working with sheep since the Middle Stone Age. That is when we humans first started developing language and learning how to manage and control fire. Our history goes way back, and sheep’s wool has been incredibly important to our survival, our society and our culture. 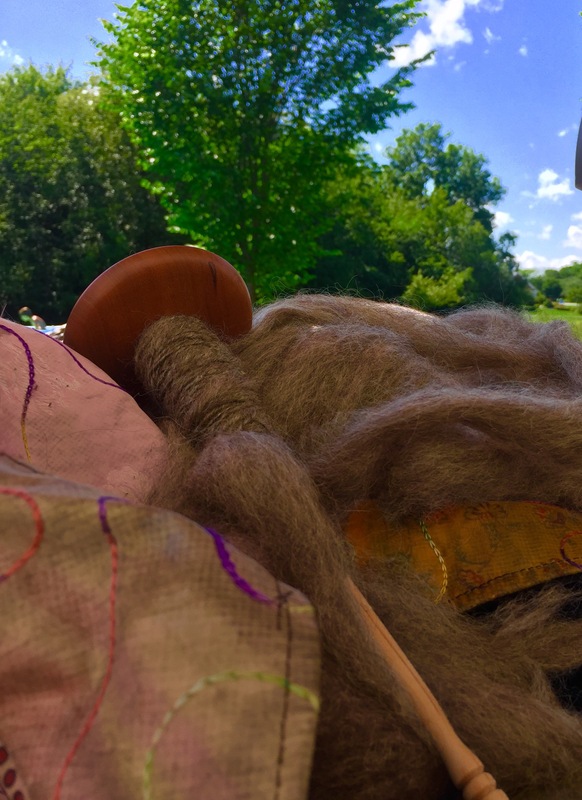 Sharing some of this with the kids was great because they really got to see that our history with fiber and with sheep is part of who we are; it’s in our archetypal DNA, and it connects us to people around the world. I showed them pictures of where sheep originated (Iran, Iraq and Afghanistan). I showed them how some sheep made it over the land bridge from Russia to Alaska during the last Ice Age. And, I showed them pictures of children and adults all over the world spinning wool and knitting. I so hope that in that brief moment, they became aware of how unifying working with wool and other fibers can be; that we are all part of the same cloth. I cannot think of anything that is more important than that in these times of great pain and suffering around the world. In a matter on an hour and a half, I worked with about 35 children. Not one child was uninterested in the fact that they were about to turn a bunch of fluffy wool into a felted piece of art. We got water everywhere. The wonderful teachers commented on having their tables cleaned really well, which was very generous. Next Time: Bring Towels. It was a little cumbersome, getting the wrapped rocks into their nylon wrap, so I helped each child with that after they got their wool design how they wanted it. I didn’t get to sit with all of the kids as they rubbed their felting rocks, but I saw some from a distance from where I getting other kids set up and I think many tuned into how peaceful the practice can be. 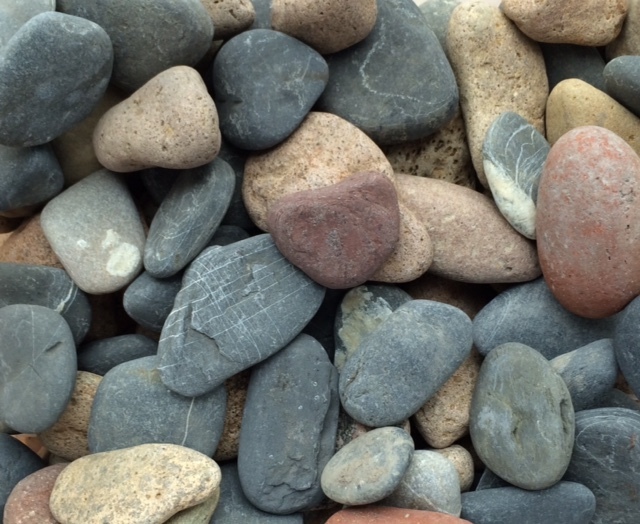 Some children talked about who they were going to give their rocks to; others wanted to keep their big, fluffy stuffed animal looking rocks for themselves. I thought it was all wonderful. I think my favorite moment was when I walked back into the first class I worked with to say goodbye and check out their finished projects. All of the kids gathered around and showed me their work with so much pride and excitement. 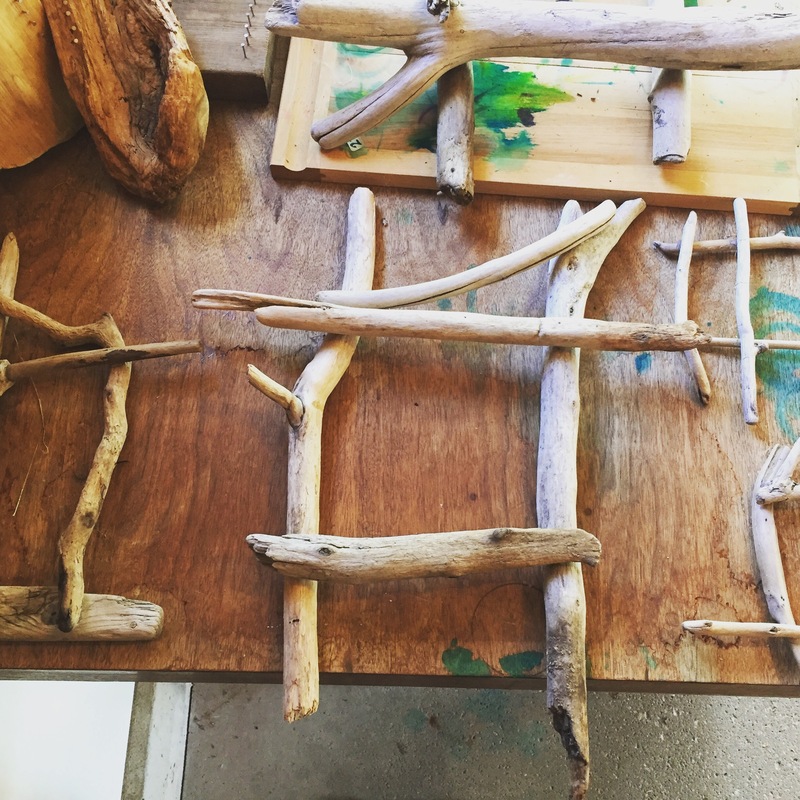 I felt like it worked~ my hope of bringing this wonderful practice to kids worked and they saw that they could make something beautiful with their own hands with a totally natural substance from animals they see all of the time here in Vermont. I was so happy for them, and for me. It being right before Christmas break, I did not have time to just rest into the pleasure of it all, but now I do, and I am. I can’t wait to do it again, and to come up with other projects to do in the coming year. Stay tuned. Categories: Fiber Art In Schools | Tags: felting, felting rocks, fiber art, history, school, teaching fiber art | Permalink.